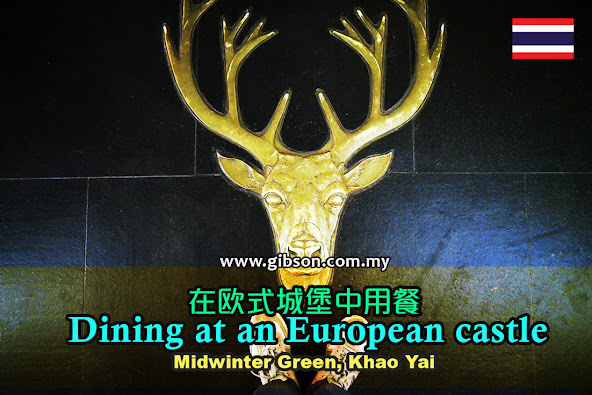 There is a famous European castle in Khao Yai but nobody stays there, because it is solely built to be as a restaurant. It was known as The Smoke House when it started in early 2011, but later in the 2014, it was rebranded with a new name as Midwinter Green by the new owner. The restaurant is so huge that it consists of an indoor and outdoor dining areas, including a store and bar area. The main building is comprised of five black-shingled peaks with a lighthouse next to it, while having a gorgeous backyard. Due to its prominent architecture, the restaurant is always a hit in the region, although the price here is slightly high, but people never stop flooding in, while the posting in social media is also keeps coming. Gibson was here in the evening and the view was so beautiful, almost all the visitors here were busy taking photographer before entering the restaurant. As you walk into the restaurant, there is a reception counter to welcome you. Then on the left is a private dining area (as shown in the photo), while on the right leads to the main dining area. The main dining area is at the end of the building, you will find a bar corner on the left and the Picnic store on the right. The Picnic store is well stocked with healthy foods and drinks, while souvenirs and plants are available too. Behind the bar is a set of stairs that leads to another dining area with a huge balcony to enjoy the breath-taking view of the verdant mountains and valleys of Khao Yai. The main dining area is decorated with dark coloured furniture that suits with the castle’s theme, while the hanging chains are nicely created to give a mysterious feel to the dining area. The backyard of the castle is actually the outdoor dining area, which is also an ideal place for organizing events, since they have a stage here. In the lighthouse, you can find a bar and the inner part of the building also nicely decorated with lights. We decided to stay outdoors as the breeze in the evening is cozy. The restaurant serves both Western and Thai food. Here is their own brand drinking water.